A screen shot of a video posted on the Internet in 2010 shows militants from al Qaeda in the Arabian Peninsula. Editor's note: Paul Cruickshank is an analyst on terrorism for CNN and alumni fellow at the NYU Center on Law and Security . (CNN) -- When historians in future years grapple with the significance of the overthrow of the Mubarak regime in Egypt 10 days ago, coming as it did in the wake of the "Jasmine" January 14 Revolution in Tunisia, they may judge it not only as a seismic event, shattering and renewing the Arab political order, but also the key watershed moment in confronting the global al Qaeda threat. The political, economic, and cultural stagnation that al Qaeda fed off for more than two decades has been replaced by the fastest moving change the region has ever witnessed, the most promising of Arab Springs. The burgeoning democracy movement across the Middle East appears to have caught al Qaeda off guard and threatens to reduce the terrorist group to irrelevance. "If you have freedom, al Qaeda will go away," said Osama Rushdi, a former Egyptian jihadist. "Al Qaeda can work under a dictatorship regime, but I think if we open the door for all people to be part of society and have human rights, then there will be security not just in Egypt but around the world," Rushdi told CNN. But others caution that the coming years will not be without dangers. In the case of Yemen, for example, some have suggested that protests may weaken the government's ability to confront al Qaeda's growing presence in the tribal areas of the country. Furthermore, the weakening of security services throughout the Arab world may allow jihadist groups like al Qaeda in the medium-term to rebuild capabilities, warns Noman Benotman, a former Libyan jihadist once personally acquainted with al Qaeda leaders, including Osama bin Laden and Ayman al Zawahiri. "This is a make or break moment for al Qaeda," said Benotman, now a senior analyst at the Quilliam Foundation, a UK counter-extremist think tank. In the short term, Benotman says, al Qaeda will need to navigate strong countervailing winds. The clamor by protesters from North Africa to the Gulf for more democracy is hardly change al Qaeda can believe in. "What we see playing out now is completely against what al Qaeda is preaching," Benotman said. In an April 2008 online Q&A with supporters, al Qaeda's No. 2 Zawahiri wrote that the only alternative to the Mubarak regime was setting up an Islamic state in Egypt, by which he meant an al Qaeda-style theocracy. "Change (in Egypt) is coming -- with Allah's permission -- without a doubt, for this corrupt, rotten regime cannot possibly continue. The important thing is getting ready for change and being patient in that and preparing to accept sacrifices, then making use of the opportunities," he wrote. But now, faced with a script they never expected, al Qaeda's top leadership could be in danger of losing the plot. The televised scenes of secular, middle-class youngsters and Egyptians from all walks of life courageously, peacefully and ultimately successfully challenging the rule of President Hosni Mubarak have been transmitted onto tens of millions of television screens across the Arab world and have captured the imagination, providing vastly more attractive role models for young Arabs, whose hopes for too long have been strangled. From Zawahiri, who has regularly weighed in on political events in Egypt, there finally appeared to be a reaction -- of sorts -- to the Egyptian protests in a tape released on the Internet pn Friday. In the audio statement, al Qaeda's No. 2 neither directly acknowledges the protests nor the removal from power of Mubarak, instead referring to "what happened and happens in Egypt." The statement was dated the second Islamic lunar month of Safar, which corresponded to the period between January 6 and February 3, indicating that it was recorded at least a week before Mubarak left office. 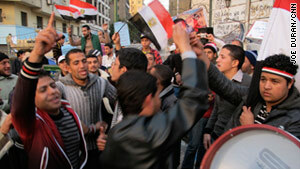 Demonstrations gathered pace in Egypt on January 25. In his statement, Zawahiri as usual railed against the Mubarak regime but also criticized democracy as a system of government, hardly sentiment that endeared him to the millions thronging that day into Tahrir Square and other locations in Egypt to celebrate a "Day of Joy." Self-preservation may explain Zawahiri's slow response. This is a make or break moment for al Qaeda. According to data provided to CNN by IntelCenter, an American company that tracks al Qaeda statements, Zawahiri two years ago managed to get messages out as quickly as 10 days after a news event. But in the past year, his fastest response time was 32 days, suggesting that intensified U.S. drone strikes in the tribal areas of Pakistan may have pushed him into deeper hiding. When he recorded the just-released message, it was possible that events could still play into his hands. During the first days of February the stakes in Egypt's Tahrir Square for al Qaeda and the United States could hardly have been higher. As the protests gathered strength, it appeared possible that the Mubarak regime might move to crush the demonstrators and that Arab street protesters would view the United States as complicit. Such a crackdown, and the frustration of raised expectations across the region, could have created a newly receptive climate for al Qaeda's key propaganda message -- that the United States deliberately props up Middle Eastern dictatorships to prevent the emergence of an Islamic world power -- and no doubt Zawahiri and other al Qaeda leaders would have exploited it to try to win recruits. But the ground shifted, Mubarak fell, and the United States strengthened its support for the demonstrators, hollowing out the al Qaeda narrative. When in the coming weeks Zawahiri finally acknowledges Mubarak's exit, he will probably be seen by most Egyptians as more out of touch than ever. "He has no popularity in Egypt anymore," said Rushdi, the former Egyptian jihadist. Rushdi spent time with Zawahiri in Peshawar in the late 1980s and remembers how Zawahiri and a number of other Egyptians with key leadership positions within al Qaeda influenced the worldview of bin Laden and pushed his fledgling organization toward armed confrontation with Arab regimes. Rushdi does not mince his words: "Mubarak is responsible for most of the problem of al Qaeda," he said. However that claim is judged, what is clear is that many of the Egyptians in Peshawar at the time of al Qaeda's creation in 1988 had been radicalized by harsh treatment in Mubarak's prisons. And Zawahiri's anger against the ally of the regime that imprisoned and tortured him would later help fuel al Qaeda's decision to launch the September 11 attacks. Rushdi says the end of the Mubarak regime will prevent men like Zawahiri from again emerging in Egypt. Benotman, the former Libyan jihadist, cautions against jumping to such conclusions. He stresses that regime change is far from complete in Tunisia and Egypt. He argues that as long as Western-backed armed forces continue to dominate politics across the region, al Qaeda's message will continue to hit home for some, adding that those who are already ideologically committed to al Qaeda's Global Jihad are unlikely to be swayed by current events. The past 10 days demonstrated that events can take unpredictable turns, offering up opportunities for Islamist terrorist groups. In Libya, an ongoing deadly crackdown on protesters could provide an opportunity to al Qaeda and regional affiliates to gain new recruits. Radicalization in recent years has run high in Libya, especially in its eastern provinces. While the Iraqi insurgency was at its peak, more young men traveled from Libya to join al Qaeda in Iraq than from any country apart from Saudi Arabia. As protests sweep the region, nowhere is U.S national security more at stake than in Yemen, from where al Qaeda in the Arabian Peninsula has twice launched attempts to attack the U.S. homeland in the last 14 months. There is a danger that the recent deadly assaults on protesters in Sanaa by pro-government elements could be exploited by al Qaeda in the Arabian Peninsula in the coming weeks to win recruits for its intensfying campaign against security services in the country, especially if the death toll rises and the protest movement is crushed. President Ali Abdullah Saleh's close counter-terrorism cooperation with the United States would allow al Qaeda to weave such a crackdown into its propoganda narrative of American-backed dictatorships oppressing Muslim populations. There is also a danger that if demonstrations gather force and there is a precipitous and chaotic end to Saleh's 33-year rule, al Qaeda may have, at least in the short term, an opportunity to extend its safe haven in the country. In the Gulf state of Bahrain, a key U.S. ally hosting the headquarters of the United States Fifth Fleet, any repeat of last week's deadly crackdown on demonstrators could also be exploited by al Qaeda, even if many (but by no means all) of those demonstrating are from the country's majority but disenfrachised-feeling Shiite community. The group have often been targeted by al Qaeda and likeminded groups across the Muslim world because their views are seen as heretical. Benotman says that with the weakening of security services in some Arab countries, the greatest future opportunities may lie for jihadist groups with a narrow regional agenda rather than those like al Qaeda focused on attacking the United States and its Western allies. According to Benotman, one of the groups that may try to rebuild its activities in Egypt is Zawahiri's very own group: Egyptian Islamic Jihad. Zawahiri fused his group with al Qaeda shortly before September 11 and aligned it with bin Laden's Global Jihad, against the desire of some within the group who wanted to carry on focusing on operations in Egypt. Earlier this month, what appears to be a breakaway faction of Egyptian Islamic Jihad issued a statement on the situation in Egypt, calling for the "elimination of the Pharaoh and his lackeys." The statement was issued from Iran under the name of Tharwat Salah Shehata. Benotman -- who met Shehata, an Egyptian lawyer turned jihadist, in Kandahar, Afghanistan, in 2000 -- says he was a leading figure in the group in the 1990s. Shehata, according to Benotman, opposed the group's merger with al Qaeda and vied with Zawahiri for leadership of the group in the years before September 11. Shehata and several other members of Egyptian Islamic Jihad appear to have eventually found safe haven in Iran. The new Egyptian Islamic Jihad statement, says Benotman, represents a relaunching of the group's campaign to create an Islamic state in Egypt. Given the geopolitical standoff between Iran and Egypt, Benotman says it is likely that Iranian authorities gave tacit approval for the group to issue the communiqué. If Benotman is right, this may be the start of a shift by some Islamist militant groups back toward attempts to topple regimes in the Arab world, weakened by the events of the past weeks. Some argue that it was the successful repression of jihadist groups by the security forces of Arab regimes that led al Qaeda to target the United States in the first place. Forced into exile in countries like Afghanistan and Pakistan, men like Zawahiri came to view the United States as the main barrier to the creation of new Islamic order at home. "Mubarak exported Egypt's problems to the whole world," said Rushdi, the former Egyptian jihadist. Egyptians march in Tahrir Square in Cairo during the 18-day protests. Outside Yemen, it may prove difficult for jihadist groups to gain traction. Violent campaigns by Islamist militants in Algeria and Egypt in the 1990s turned the vast majority of the population against them. Furthermore, decades of repression by security services destroyed many jihadist groups' capabilities or restricted them to remote areas like the Sahel region south of Algeria and Egypt's Sinai Desert. Additionaly, in some countries, like Libya, reconciliation efforts have reduced the risk of a return to violence because they removed from the scene established jihadist outfits capable of recruiting and organizing radical-leaning youth. Several former members of the Libyan Islamic Fighting Group were released Wednesday as a part of an ongoing peace process initiated by Saif al Islam Gadhafi, the son of Libya's leader, which saw the group renounce violence in Libya. But what such jihadist groups should fear most is a real and sustained transition toward democracy, broad-based economic opportunity and freedom of expression in the Arab world. Far fewer young Arabs would probably then be attracted to violent Islamist ideology. Like the protesters of Tahrir Square, they would find meaning, purpose and opportunities in other causes. Change, of course, will not come overnight. And in some Arab countries, even if pro-democracy demonstrators prevail, political transformation will probably take many years to achieve. Yemen is a case in point because of its weak state institutions, lack of an educated middle class and strong tribal structures. But if there is a pan-Arab political opening, the momentum will be strongly against al Qaeda. The events in the Arab world may also have an impact on homegrown extremism in the West. In Europe, radical Islamist preachers have been able to prey on a sense of identity loss, discrimination and alienation experienced by second- and third-generation Muslim immigrants from the Arab world and South Asia. Their message has been that such youngsters should devote themselves to efforts to remove an oppressive Western presence from the Muslim world so that a theocratic Islamic Golden Age can be recreated. But at a time when images of Tahrir Square rather than American tanks are dominating Al Jazeera and other news outlets popular amongst immigrant communities in Europe, that radical vision may start to lose its luster. Moreover, it will be harder for radical preachers to sell the line that Western-style democracy is inherently anti-Muslim and un-Islamic, if Arab diaspora communities see it empowering their relatives on the southern shores of the Mediterranean. If the winds are indeed changing from an era of Islamist militancy to democracy in the Middle East, nothing is more illustrative of this than the story of Osama Rushdi, the former Egyptian jihadist interviewed for this piece. Previously the spokesman of Gamma Islamiya, an armed Egyptian Jihadist group, Rushdi resigned from the group in the mid-1990s, renounced violence and has in recent years worked closely together with a range of Egyptian opposition figures in the UK, including secular liberal intellectuals under the auspices of the Save Egypt Front to bring constitutional democracy to Egypt. Last year, he even helped organize a conference in London for Mohammed ElBaradei, a Nobel Prize laureate and potential Egyptian presidential candidate, and he now hopes to return to Egypt. "The Egyptian young people created one of biggest wonderful peaceful civilian revolutions, so now they are proud about themselves and demand a civilian state and democratic institutions," Rushdi said. In the long term, a successful democratic transition in the Arab world would arguably make the United States significantly safer from al Qaeda terrorism. The threat of attack would remain because, as September 11 illustrated, even a small group of dedicated individuals can create terrible carnage, and al Qaeda today continues to enjoy safe havens in Pakistan and Yemen from where it can organize new attacks. But if al Qaeda's recruiting efforts are significantly hampered, so will its campaign of global terrorism.